Valletta is the capital of the island nation of Malta. A harbour city, Valletta preserves much of its 16th century architectural heritage built under the Hospitallers. Valletta is the capital city of Malta, colloquially known as Il-Belt or The City in Maltese. Geographically, it is located in the South Eastern Region, in the central-eastern portion of the main island of Malta having its western coast with access to the Marsamxett Harbour and its eastern coast in the Grand Harbour. The historical city has a population of 6,444, while the metropolitan area around it has a population of 393,938. Valletta is the southernmost capital of Europe and the second southernmost capital of the European Union after Nicosia. Valletta contains buildings from the 16th century onwards, built during the rule of the Order of St. John also known as Knights Hospitaller. The city is essentially Baroque in character, with elements of Mannerist, Neo-Classical and Modern architecture in selected areas, though the Second World War left major scars on the city, particularly the destruction of the Royal Opera House. The City of Valletta was officially recognised as a World Heritage Site by UNESCO in 1980. The official name given by the Order of Saint John was Humilissima Civitas Valletta—The Most Humble City of Valletta, or Citta Umilissima in Italian. The city's fortifications, consisting of bastions, curtains and cavaliers, along with the beauty of its Baroque palaces, gardens and churches, led the ruling houses of Europe to give the city its nickname Superbissima—Most Proud. 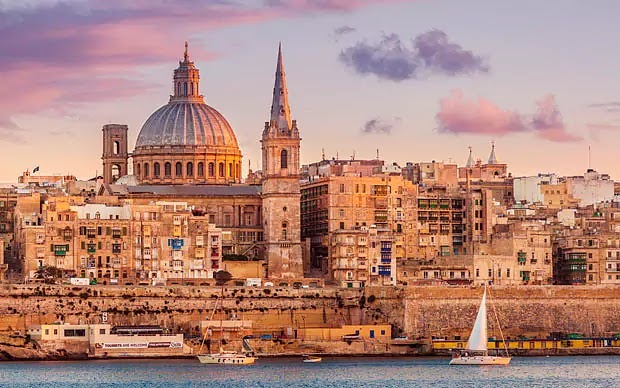 The entire city of Valletta has been a UNESCO World Heritage Site since 1980, along with Megalithic Temples of Malta and the Hypogeum of Ħal-Saflieni. On 11 November 2015 Valletta hosted the Valletta Summit on Migration in which European and African leaders discussed the European migrant crisis.After that, on 27 November 2015 the city also hosted part of the Commonwealth Heads of Government Meeting 2015. The architecture of Valletta's streets and piazzas ranges from mid-16th century Baroque to Modernism. The city is the island's principal cultural centre and has a unique collection of churches, palaces and museums and act as one of the city's main visitor attractions. When Benjamin Disraeli, future British Prime Minister, visited the city in 1830, he described it as a city of palaces built by gentlemen for gentlemen,and remarked that Valletta equals in its noble architecture, if it does not excel, any capital in Europe, and in other letters called it comparable to Venice and Cádiz and full of palaces worthy of Palladio..
Buildings of historic importance include St John's Co-Cathedral, formerly the Conventual Church of the Knights of Malta. It has the only signed work and largest painting by Michelangelo Merisi da Caravaggio. The Auberge de Castille et Leon, formerly the official seat of the Knights of Malta of the Langue of Castille, Leon and Portugal, is now the office of the Prime Minister of Malta. The Magisterial Palace, built between 1571 and 1574 and formerly the seat of the Grand Master of the Knights of Malta, used to house the Maltese Parliament, now situated in a purpose built structure at the entrance to the city. The Magisterial Palace still houses the offices of the President of Malta. The National Museum of Fine Arts is a Rococo palace dating back to the late 1570s, which served as the official residence of the Commander-in-Chief of the Mediterranean Fleet during the British era from the 1820s onwards. The Manoel Theatre was constructed in just ten months in 1731, by order of Grand Master Antonio Manoel de Vilhena, and is one of the oldest working theatres in Europe. The Mediterranean Conference Centre was formerly the Sacra Infermeria. Built in 1574, it was one of Europe's most renowned hospitals during the Renaissance. The fortifications of the port, built by the Knights as a magnificent series of bastions, demi-bastions, cavaliers and curtains, approximately 100 metres (330 ft) high, all contribute to the unique architectural quality of the city. l-Arcipierku – an area close to the Sacra Infermeria. Its name possibly derives from archipelago since it contains a number of lanes which break up the area into many "islands" of houses, or from archi-borgo since the area is located just outside Fort Saint Elmo. il-Baviera – an area around the English Curtain, bounded by Old Bakery, Archbishop, Marsamxett and St. Sebastian Streets. It is named after Auberge de Baviere. il-Biccerija – an area close to il-Baviera, named after the slaughterhouse which was formerly located there. Manderaggio an area behind Manderaggio Curtain, bounded by St. Mark, St. Lucia, St. Patrick and Marsamxett Streets. This was meant to be a small harbour or mandracchio but it was never completed, and a slum area developed instead. The slums were demolished in the 1950s and were rebuilt as housing estates. Saint James Cavalier, originally a raised gun platform, was converted into a Centre of Creativity in the year 2000 as part of Malta's Millennium Project. It now houses a small theatre, a cinema, music rooms and art galleries. Various exhibitions are regularly held there. Since it was opened it has welcomed over a million visitors. The Valletta International Baroque Festival is held every year in January. Jazz music in Malta was introduced in the Strait Street area, frequented by Allied sailors during both world wars. Malta's Jazz Festival took place here. Strait Street is also known as The Gut. This area is undergoing a programme of regeneration. The city's dual band clubs are the King's Own Band Club and La Valette National Philarmonic Society. Saint Dominic's feast is celebrated in Valletta on 4 August or before. The feast of Saint Augustine is celebrated on the third Sunday after Easter. The city's residents also conduct an annual procession in honour of St. Rita. Malta International Airport serves Valletta, with the airport located 8 kilometres (5.0 mi) from the city in the town of Luqa. Malta's public transport system, which uses buses, operates mostly on routes to or from Valletta, with their central terminus just outside the city's entrance. Traffic within the city itself is restricted, with some principal roads being completely pedestrian areas. In 2006, a park and ride system was implemented in order to increase the availability of parking spaces in the vicinity of the city. People can leave their personal vehicles in a nearby Floriana parking lot and transfer to a van for the rest of the trip, which takes a mere few minutes. In 2007 a congestion pricing scheme was implemented, the Controlled Vehicular Access system, in order to reduce long-term parking stays and traffic while promoting business in the city. An ANPR-based automated system takes photos of vehicles as they enter and exit the charging zone and vehicle owners are billed according to the duration of their stay. Various exemptions and flexible billing rules make the system the next evolutionary step of systems like the London congestion charge programme. Main differences from the London system include ex post invoicing with financial incentives/penalties for early/late payment, prepayments not day-specific, hourly instead of daily rates, a maximum daily charge (8 hours), free dashes which is free if duration under 30 minutes. This is defined as free access periods for delivery and service vehicles. Valletta was one of the earliest sites inscribed by UNESCO on the World Heritage list. Referred to colloquially as Il-Belt or The City, it takes its name from its founder, Grandmaster Jean Parisot de la Valette. With its large array of shops, catering establishments, entertainment venues and culture, Malta's capital has what it takes to capture people's imagination. Most bus routes and many arterial roads converge on Valletta. However, once inside the city there are many one-way streets and some pedestrian zones. Parking near one's destination can be difficult. There is a large multi-storey car park in Floriana, about half a kilometre from the City Gate entrance to Valletta. In front of the main gate of Valletta is the main bus station for the entire island, rather than buslines covering the island in a grid, they all spread out from here and return to here. Public Scheduled Ferry Service. There is a ferry that departs from Sliema the Strand - Ferries, which will take you across beautiful Marsamxett harbour and past Manoel Island for €1.50, one way or €2.80 day return. Departures are every 30 minutes. Another little known way is to visit the Three Cities, Vittoriosa , Senglea and Cospicua is by ferry which departs from behind the old Customs House opposite the Barrakka Lift, a spectacle in itself. Departures are every 30 minutes and it is only a 6 minute crossing. The cost is €1.50 or €2.80 day return. The cost for using the Barrakka Lift which takes you up to Valletta is included in the ferry fare. The Grand Harbour is a must to visit. Once at the Three Cities, you may also then take the Maltese version of the gondola, the so called Dghajsa for a spectacular Grand Harbour short excursion. Virtu Ferries runs ferries to Pozzallo and Catania in Sicily. The Valletta peninsula is only a couple of kilometres in length and so the ideal way is to do everything on foot also allowing one to make use of the atmospheric stairs throughout this steep city. However, the city is built on a ridge, and is steep in parts requiring walking up and down stairs in some places, which can be tiring. The alternative would be doing it by car which is not ideal for visitors due to lack of parking space, direction signs and the fact that the streets are very narrow, often one way and confusing if unfamiliar. Most of the main tourist attractions are along the main street Triq ir-Republika, which does not involve steep hills. To get further historical information about the numerous places of interest through Valletta it can be useful to hire an audio guide. It is available in different languages (Maltese, English, Italian, French, Dutch, German and Spanish) from the Archaeology Museum in Republic Street. You can choose independently from the 24 stops and it is not necessary to follow the given order. Stops can easily be skipped or visited in another sequence when tired or full of the new information. Another possibility is to rent one of the horse carts or Karozzin, but be sure to bargain. St. John's Co Cathedral is unremarkable from the outside but incredibly ornate on the inside. Each of the different langues or knights of a particular nationality had their own langue has a their own chapel lined along the side of the nave in which they try and outdo each other in splendour. The barrel shaped ceiling is a single huge fresco, the lifework of famed artist Mattia Preti. And last but not least the floor is entirely taken by knight's graves all intricately inlaid marble in different colours, a recent book on the subject describes it as the most beautiful floor in the world. This relatively unknown cathedral can count itself one of the most impressive in Europe. Open 9:30am and 4:30pm on weekdays and 9:30am and 12:30pm on Saturdays. Entrance is through the Carappechia Annex on Republic Street in between St John's Street and St Lucy Street, directly opposite the Law Courts. As soon as you enter you will be provided with an audio guide included in the entrance fee which leads you through the cathedral in 24 stops. You to get further historical information about the paintings and special parts of St. John’s Co-Cathedral. The Cathedral Museum holds two works by Caravaggio who was briefly himself a Knight, one of them being his masterpiece the famous huge Beheading of St. John the Baptist. The Palace of the Grand Masters now is the President's office and the Maltese parliament. The staterooms, when accessible are quite impressive. It also houses the Knights' armoury which is open to visitors daily from 9am–5pm. However, all other parts of the palace are closed to visitors, so what they can see is limited. At the entrance you can receive an audio guide which is included in the entrance fee. It provides you with further historical information about the various armoury of different eras beginning from the medieval chain mail up to the 17th century armour. The Malta Experience, despite not being entirely cheap (3.5 Liri) visitors who have any interest in culture or history and who haven't exhaustively read up on the country before coming here would do well by starting their visit to Malta by going here as it is an excellent introduction to the country. It gives an impression of major events that shaped the country, but as it's only half an hour long and meant for first-time visitors one shouldn't expect an in-depth dry scholarly treatment of the subject. St Elmo Bastions, Mediterranean Street. The Upper Barrakka Gardens at the upper south side of the peninsula offer a jaw dropping view of the Grand Harbour. Go on a sunny day and bring champagne. The National Museum of Archaeology Even though Malta has an impressive and unique ancient history this museum housed in the former Auberge de Provence in Republic street can be rather a disappointment. The museum is currently partially being renovated hopefully bringing something more worthy of its name. Auberge de Provence, Republic St.
Fort St. Elmo was built at the tip of the peninsula by the knights after the Dragut Raid of 1551. During the Great Siege of 1565 the Turks made the mistake of choosing to first try and take this fort, for which they had planned a week. Instead the knights and soldiers present fought desperately for a month, buying essential time. The knights in the fort knew they were fighting to the death, and so rather than being taken off the ramparts when wounded, knights would fight on while seated in chairs until they couldn't even lift their arms any more. Today the fort houses the Police Academy and is only partially open on the weekend. Manoel Theatre is La Scala in miniature, a very beautiful 17th century theatre in original state. One of the oldest active theatres in Europe, it is the place for many classical music performances but also for instance the hilarious Christmas Panto. The imposing defence walls and ramparts at the entrance to Valletta built by the Knights in the late 16th century are interesting to explore. The National Library is an evocative old library on Republic Square, next to the Grandmaster's Palace. Only part of it is open to the public, you will need to take a Passport or other Photo ID to get in. The entire archives of the Knights of St. John from the Crusades in the 11th century until 1798 when Napoleon took Malta, are kept here, in true Maltese style in rickety wooden filing cabinets. They were proud to mention that recently a sprinkler system had been installed to protect this priceless collection. The Sacra Infermeria was the great hospital built by the knights in the 16th century, open to everyone, it had the highest level of healthcare available in Europe at the time. It was mostly destroyed during WWII, it was rebuilt and now functions as a conference centre. It is rarely open to the public. The Casa Rocca Piccola - a Maltese Noble Family House on Triq ir-Republika, a few hundred yards past the Grand Master's Palace on the right hand side. Very enjoyable. The National Museum of Fine Art. The biggest collection of paintings by Mattia Preti. Also found here are paintings by Ribera, Erardi and many well known Caravaggisti. St. James Cavalier is a fortress opposite the Auberge of Castillewhich is today the Prime Minister's office. It was built as part of the elaborate defence systems of Valletta. Today it houses a Centre for Creativity, with its own theatre, cinema, music room and exhibition halls. Its twin, St. John Cavalier is currently the embassy of the Knights of St. John who are, like the Vatican, recognised by several countries as a sovereign entity. Lascaris War Rooms. is an underground complex of tunnels and chambers in Valletta, Malta that housed the War Headquarters from where the defence of the island was conducted during the Second World War. The rooms were later used by NATO and they are now open to the public as a museum. Also features the Saluting Battery, where cannons are fired at noon. 3 Euros. You can take a spectacular walk along the sea around the outside of the city walls. Valletta is a peninsula, with the sea surrounding most of the city. To the north of Valletta lies Marsamxetto harbor whilst to the south is the Grand Harbour, arguably one of the nicest natural harbours in the world. The scenery is just breathtaking and you can feel yourself immersed in history as you enjoy the magnificent views of the harbour with its many forts and marinas. A really good spot to take in the views is the Upper Barrakka Gardens but the vista spot does get quite busy at times and there is little shade. An even better spot is St. Barbara Bastion, a quiet, residential street lined with hundred year-old olive trees which offer some respite on those sunny Maltese days. The views will sooth your mind. If you go to the mooring place where the ferry for Sliema leaves on the Marsamxetto side, there is the possibility to walk over the rocks towards the tip of the peninsula and then around it coming back up into the city just next to the Malta Experience. This walk takes about 30 minutes and is done by virtually no-one. You may also opt to take one of the free walking tours around the city of Valletta organised by tour companies such as Colour My Travel. All day and night in St George's Square, there is a lovely water fountain, with coloured spouts of water which pop up and down - a fantastic play opportunity for children. They will get wet, so don't let them go near if they are wearing their best clothing. Great fun for kids and a great way to cool down on a hot summer's day. Several of the Maltese English language institutes are in Valletta. The main street of Valletta is Republic street, a busy pedestrian zone leading down the middle of the Peninsula from the main gate down to Republic square, this is where many of the better shops are located, although it cannot quite compete with Sliema for clothing. The best souvenir shop can be found at the Malta experience, but there are many other reasonable souvenir shops in Valletta. At the beginning of the Republic street there are several reasonable souvenir shops but prices are far cheaper if you walk 20m down South street which crosses Republic street very soon after you have entered through the city gates. The best bookshop of Malta is definitely the one formerly known as Sapienzas now Agenda Bookshop as of 2008 on Republic street but can be a bit more expensive. There is a daily market selling cheap clothing in the parallel street to Republic street called Triq il-Merkanti, or Merchants street. Valletta has a collection of decent restaurants, due to most of the tourists residing either in Sliema or on the north coast of the island there are fewer of the trashy variety, although it does have the ubiquitous fast-food places like Burger King, McDonald's, Pizza Hut. The Valletta waterfront is absolutely amazing especially at night, it contains different types of restaurants, from Chinese to the Hard Rock cafe, there is also a book shop and jewellery shop in the same waterfront. If you keep your eyes open you may run into one of the charming traditional bakeries tucked away here and there where the tourist economy hasn't forced prices up yet and one can get lovely steaming fresh bread for mere cents. La Mere Restaura, situated in Merchant Street, Valletta, few metres down from the old market and very close to The Place. De Robertis (Roof Top Restaurant), Castille Square c/w St. Paul's St. This was the best Restaurant that we eat at while in Malta. The view is incredible and the food was very tasty. Trattoria da Pippo is where locals go for lunch, they have an excellent selection of seafood dishes. 136 Melita St.
Caffe Cordin, on Republic square has a venerable history behind it, and has a reputation to match. You can eat out in Republic Square at the Cordina tables, and this is the place to be seen having lunch although the food isn't as good as one may expect. The coffee bar inside is the best place for a quick Espresso whilst admiring the ceiling. 244/5 Republic St.
Malata Restaurant, if one is looking for a place in Valletta to have dinner on a terrace, then this is a nice place to go slightly later in the evening when the square in front of the Grand Master's palace is almost emptied of parked cars. There is Live Jazz on Tuesday nights. Palace Sq. Pintonino Restaurant Tucked a few meters away from the Valletta waterfront, a fine restaurant that offers great food at reasonable prices, with a selection of more than 150 wines. Trabuxu, No. 1d, Strada Stretta. A charming wine bar in an ancient cellar serving light meals. It's at the beginning of a small alley parallel to Republic street, look for the wooden sign with the corkscrew. Rampila Restaurant and Wine Baris located opposite St. John's Cavalier on a Valletta back street corner.Turning first left after passing into to the city through City Gate and then left again you find an olive tree, an antique stone bench and the railings around the entrance to Rampila. A Fine Maltese/Mediterranean Fusion Restaurant and Wine Bar in Valletta were the food is as magical as the ambience. Situated in the impressive bastions of Valletta; a UNESCO World Heritage Site one can enjoy a fine plate of fresh seafood, meat, game, pasta or risotto. Alternatively one can indulge in an exquisite platter and/or dips accompanied by wine from an extensive selection. Asti Guesthouse, St Ursula St. Charming Guesthouse with the warmest possible welcome. In a great location just around the corner from the Upper Barakka Gardens and a five minute walk from Bus Station. Not en-suite, but three double bathrooms between nine rooms means there is no problem with accessing facilities. Price includes breakfast in a lovely room with a huge chandelier. Osborne Hotel, 50 South St. Located in a converted palace. $50. Grand Hotel Excelsior, Great Siege Rd, Floriana. British Hotel, 40 Battery St. Friendly two-star. Has fantastic staff and a really cool bar with one of the best views in Valletta. $75. The Phoenicia, The Mall, Floriana, checkin: 2PM; checkout: noon. Located just outside of the main gate, this 5 star luxury hotel, with the possible exception of Xara palace in Mdina, is the most exclusive place to stay in the country. This is where Queen Elizabeth II who was Queen of Malta from 1952-1974 recently chose for her reception when visiting Malta. The place has a definite old colonial style about it. Boutique Escape Malta, Central Valletta. A luxury boutique self-catering apartment located in central Valletta being close to Malta's history and culture including St Johns Co-Cathedral, the Presidential Palace and a large selection of museums, restaurants, bars, café's, the cinema, gym and shopping facilities. Comes with free airport transfer and champagne welcome hamper upon arrival. Also good for corporate and extended stays. From €90 per night. Maison La Vallette, Marsamxett Harbour. A discreet self catering luxury town house, situated in the old part of Valletta - dating back to the Knights of Malta. The house has a large bedroom with ensuite facilities, bathroom with tub, living room and separate kitchen. The decor is a mix of Maltese style baroque and bespoke designer furniture. An ideal setting for a romantic stay, with easy access to the rest of the island. €81. Valletta G-House, near Fort St Elmo. Artist's private townhouse featured for its beauty in magazines and voted travel writer's choice by both Britain's Guardian and by the Lonely Planet Guide. Large bedroom with striking floor tiles and traditional 'galleria', rustic kitchen with all mod-cons and lounge. From €595 per week. Valletta Nobile, Close to St John's Co Catherdral. Valletta Nobile is a 400 year old Maltese townhouse full of character and charm. This self catering accommodation in Valletta is a discreet hide-away tailored for the discerning traveller. A unique house which expresses the joy of the noble life of knighthood mingled with the playful colours of Maltese baroque. It offers an intimate experience of living in a world heritage site, nestled between opulent baroque churches and the Grand Master’s palace, just minutes away. €85. Apart from some restaurants and bars open in the evening Valletta still has next to nothing happening in terms of nightlife, so apart from Republic street the streets are quite empty late at night. Most of the usual petty crime that travelers are confronted with may happen in Sliema and St Julians, but it's something to keep in mind. Opposite to the Trabuxu wine bar at the beginning of Strait Street there is Ziffa Internet Center which offers a wide selection of services including internet browsing and low cost international calls. Almost all of Malta's bus routes start from the large roundabout just outside the main gate, making everywhere in the country accessible. There is also the ferry which goes to Sliema for €1.00. Hal Saflieni Hypogeum. 7 tours will be conducted daily, starting on the hour from 9AM till 4PM. There is no tour at noon. is a subterranean structure excavated c. 2500 B.C. Thought to be originally a sanctuary, it became a necropolis in prehistoric times. It is the only prehistoric underground temple in the world. To ensure its conservation, the site’s microclimate is strictly regulated. For this reason, the site is open to a maximum of 80 visitors each day. A tour of the site starts with a brief introductory exhibition and multilingual audio-visual film focusing on the temple building peoples and the Hypogeum’s relationship to Malta’s temple sites. Booking is a necessity. Lm4, €9.32 available from website. Tarxien Temples. 9AM-5PM daily, last admission 4:30PM. This site, dating from 3600 to 2500 BC, is the most complex of all temple sites in Malta and consists of four megalithic structures Lm 1, €2.33.